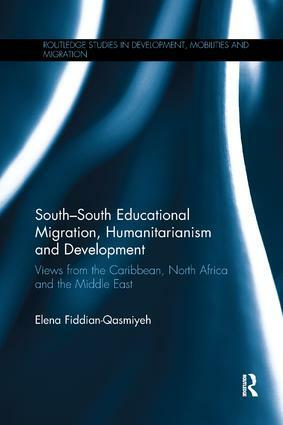 This ground-breaking book is one of the first to analyse the important phenomenon of South-South educational migration for refugees. It focuses particularly on South-South scholarship programmes in Cuba and Libya, which have granted free education to children, adolescents and young adults from two of the world’s most protracted refugee situations: Sahrawis and Palestinians. Through in-depth multi-sited fieldwork conducted with and about Sahrawi and Palestinian refugee students in Cuba and Libya, and following their return to the desert-based Sahrawi refugee camps in Algeria and the urban Palestinian refugee camps in Lebanon, this highly pertinent study brings refugees’ views and voices to the forefront and sheds a unique light on their understandings of self-sufficiency, humanitarianism and hospitality. It critically assesses the impact of diverse policies designed to maximise self-sufficiency and to reduce both brain drain and ongoing dependency upon Northern aid providers, exploring the extent to which South-South scholarship systems have challenged the power imbalances that typically characterise North to South development models. Finally, this very timely study discusses the impact of the Arab Spring on Libya’s support mechanisms for Sahrawi and Palestinian refugees, and considers the changing nature of Cuba’s educational model in light of major ongoing political, ideological and economic shifts in the island state, asking whether there is a future for such alternative programmes and initiatives. This book will be a valuable resource for students, researchers and practitioners in the areas of migration studies, refugee studies, comparative education, development and humanitarian studies, international relations, and regional studies (Latin America, Middle East, and North Africa). South–South cooperation: from dependency to self-sufficiency?